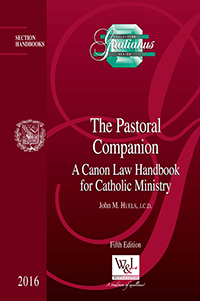 The Pastoral Companion is a handy reference, commentary, and textbook on canon law intended for Catholic clergy and lay ministers and those preparing for ministries in the Catholic Church. In addition to the pertinent canons of the Code of Canon Law and the Code of Canons of the Eastern Churches, it includes citations from liturgical, ecumenical, and other important laws of the Holy See as well as decrees affecting the ministry from the conferences of bishops of the USA and Canada. Arranged topically rather than canon-by-canon, the reader can easily consult any topic desired. The commentaries aid the student and minister in their understanding and application of the law in the pastoral setting. 193 visitors have consulted this page.